Metal Gear Survive has finally emerged into the light of day. 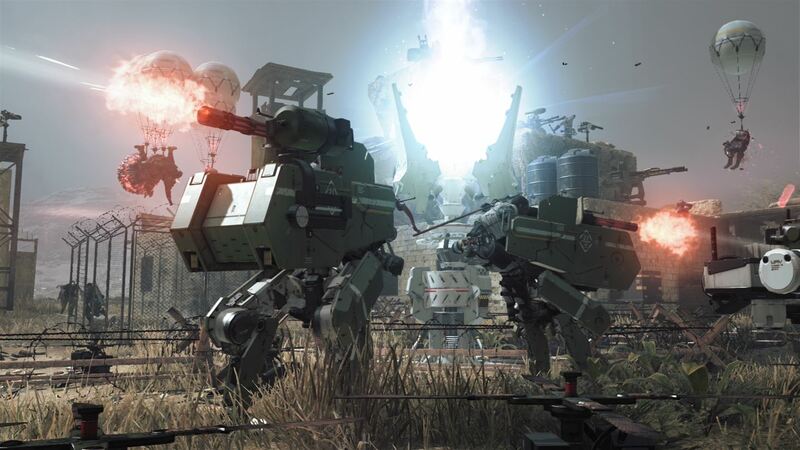 Given that the game is chiefly known as “the first Metal Gear since the acrimonious divorce between Kojima and Konami”, the question in place has to centre around whether the old Metal Gear magic is still found clinging to the series, or is it just trading off past glories? I headed into Dite to find out. The first thing that hits you with Survive is the story, and it’s nice to see that it’s not only Kojima who can make grand, overlong cutscenes. I don’t think I had to interact with the game, other than to press A, for at least the first 20 minutes. Set in the timeframe between Ground Zeroes and The Phantom Pain, the story revolves around your avatar, a soldier who was killed in the defense of Mother Base. Interestingly, you have been sucked into the sky via a wormhole, lost an arm when the wormhole closed and subsequently fallen to your death. However, it appears that the brief contact was enough to infect us with a parasite, one that has not only brought us back to life, but has also restored the missing arm! So far, so good, you might be thinking, but there is a catch: we are now classed as a danger to the world, and must be made safe. Acting against his superior’s wishes, the lead researcher into this parasite, a man called Goodluck, sends us through another wormhole to Dite – pronounced Dee-tay – with the mission to find a cure, and help any other survivors that we find. Once through the marathon cutscenes (seriously, bring popcorn for they are lengthy! ), we find ourselves alone and surrounded by monsters. These are identified as Wanderers, and are apparently what happens when the parasite takes over the body of its victims. They look like zombies, with the same shuffling gait and aimless wandering about, but where their head should be is just a large red crystal, with another crystal growth on their backs. If you can sneak up behind a Wanderer, it is possible to put them down with a sneak attack by stabbing them in the back, otherwise aiming for the head seems to do the most damage. They seem to operate at about the same mental capacity as zombies as well; if you duck out of sight around a corner or behind a wall, they lose interest and carry on with their day. If they spot you and become alerted (complete with the patented Metal Gear alert sound), then they will chase you, attacking until you put them down. To aid you in staying stealthy, there is a threat ring displayed around your character when they are near the baddies, with a graph running around it. The higher the spikes on the graph get, the more danger you are in, so crouching and sneaking is very much the order of the day. Going all Rambo and taking on all comers will soon see you flattened under a tide of crystal infested nastiness. There’s a very good risk/reward mechanic running through these encounters, as each Wanderer that is destroyed can be harvested for Kuban energy, which is used to level up your character – and anything you craft – later in the game. 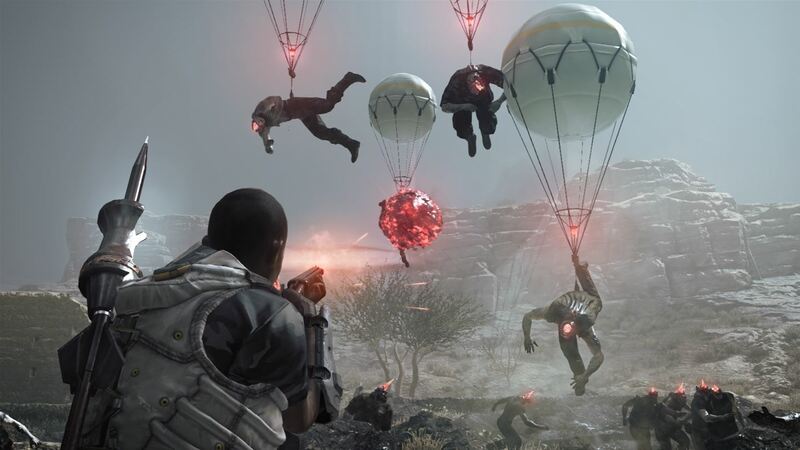 Metal Gear Survive holds your hand to a certain degree, with tutorials about how to avoid being spotted, crafting weapons and so on. In fact, each and every time a new aspect of the gameplay is introduced, there is a series of cutscenes explaining what to do. Never once did I have to scratch my head and wonder what to do in a situation, which is a testament to the quality of tutorials. It isn’t long before you are introduced to your first survivor, a soldier named Reeve, who is injured and doesn’t seem to be very much use! We also meet the AI in charge of the Base Camp – Vergil – which seems to be undergoing some kind of schizophrenic episode, as sometimes it talks to you in a male voice, and sometimes female. It’s confusing, but you do get used to it, and to be fair it’s not that weird in a world of crystal headed zombies. Anyways, it turns out that there were people here before, The Charon Corps, who collected a lot of information about Dite and the creatures of this dimension. Guess who has to retrieve this information from the memory stores that The Charon Corps utilised? That’s right. You! What transpires is a series of missions, with the story getting progressively more bonkers each time, until it encompasses sentient AI, nano machines, wormholes, giant monsters and time travel. The craziness of the story certainly hasn’t suffered for the loss of Kojima, and to be honest it’s interesting to see just how weird things can get. You’ll be found hunting animals for food, such as sheep, goats and wolves (yes, your character can make a delicious grey wolf soup), to missions in which you’ll be left to retrieve memory cores, and reactivating dormant wormhole transporters that allow the exploration of wider areas of the map. There is a substance called The Dust, that is fatal when breathed in, so you have to explore carrying your own oxygen supply. This makes extended expeditions through the denseness very tense, as you have to accomplish the mission and get out before it runs out. It is possible to use Kuban energy to create more oxygen, but this cannot be used indefinitely as your air tank degrades each time it happens. So as an example, the mission is to restart a dormant wormhole generator to use as a fast travel point. You can set waypoints on the map, and this is great outside the dust as they are always visible, but inside the dust they quickly disappear. You will need to orientate yourself before hoping you don’t have to detour to avoid a million Wanderers in your path – when you get nearby, Vergil will inform you that you are near your objective and allow to navigate a bit more easily by marking where the generator is. What follows is a mixture of Horde mode taken straight from Gears of War, and the building mechanic from Fortnite, requiring you to set up defences with fences and so on, before activating the transporter and getting it to reboot. The reason you want to get your defences in place first is because the Wanderers are attracted to the energy from the generator starting up, and will come knocking on your door. You’ll then have to hold them off, allowing the generator to boot before it sends out a surge of energy that kills any enemies in the area. Helpfully, one of the fences you can build is of the chain link variety, which allows thrusting weapons to penetrate the enemies. So if you sit on one side of the fence, you can hit them with spears, guns and arrows, saving the blunt weapons until the baddies topple the fences. With increases in levels and the finding of new recipes, you can build the likes of Claymores to protect certain paths, and funnel the bad guys into a killing field with Molotovs and fences to allow you to become ever more efficient at killing. In a sense, the stupidity of the Wanderers is something of a handicap, as they will run into a fence and then stay there, damaging it until they are killed. It’s not an exaggeration to say that you can run out from behind a fence, shank the Wanderer in its weak spot, and then run back before it even notices. As you advance through the story, tougher enemies show up, such as bulbous headed Bombers, requiring a shift in tactics. This isn’t even mentioning the gigantic Lord of Dust, a massive multi-limbed monster who will certainly mess you up in a heartbeat if you attempt to beat him up before MGS Survive is ready for you to do so. Cooperative online missions are available as well, and take a similar approach to that found in single player. The way it plays out is again like Horde mode, but this time requiring teamwork to collect resources, protect the path to a digger, and then defeat the waves of enemies as they try to attack. Helpfully, the path the baddies will take is marked on the ground, allowing planning to put the defences where they will do the most good. Well, that’s the theory at least, because in practice, the online world seems to have fallen prey to the dust. With multiple attempts behind me, I have only managed to get into one match with a randomer – with a maximum of four players at any time remember – who spent the entire match on a rooftop watching me struggle to contain the enemies on my own. Now obviously this isn’t the fault of Survive, but it does make the online sector dead; pure matchmaking is more or less a waste of time. Graphically, and the Fox engine used in Survive is still as powerful as ever, making the game look very good indeed. When not in the dust, draw distances are very good, allowing you to spot baddies from some distance away and plan your approach accordingly. In the dust, as you might expect, the vision range is severely curtailed, making everything feel more tense as you attempt to sneak about without attracting too much attention. 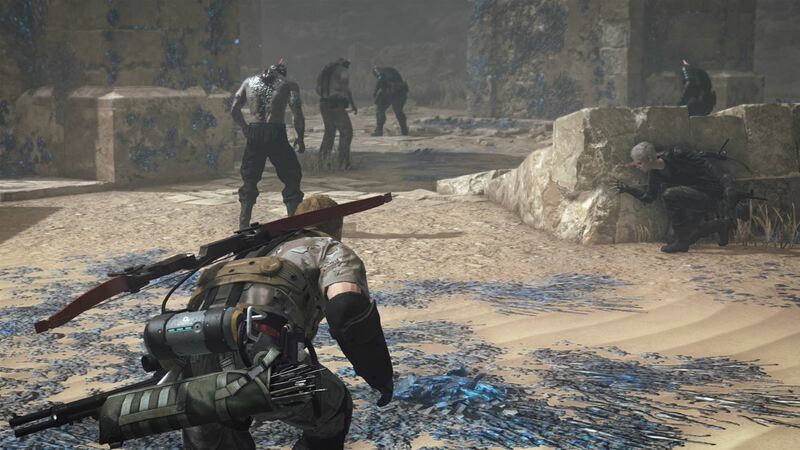 The sounds are suitably scary as well, with growling and grumbling baddies, the familiar “You’ve been spotted” Metal Gear sound being present and correct, and the impact of your weapon on the crystalline heads of the enemies sounding properly crunchy. The bow whispers, the guns’ roar, and the bat makes a meaty swoosh as you swing it around; it’s fair to say that the presentation is very good indeed. The crafting interface is easy to understand as well, and securing and building up any base is a rewarding grind of material collection, creation and more collecting. You can also buy material or weapon cases with real money, but again I haven’t felt the need to indulge. The only other complaint that I have is that it is somewhat samey, with a grind and reward mechanic playing throughout – do a mission, get stuff, build stuff, rinse and repeat. 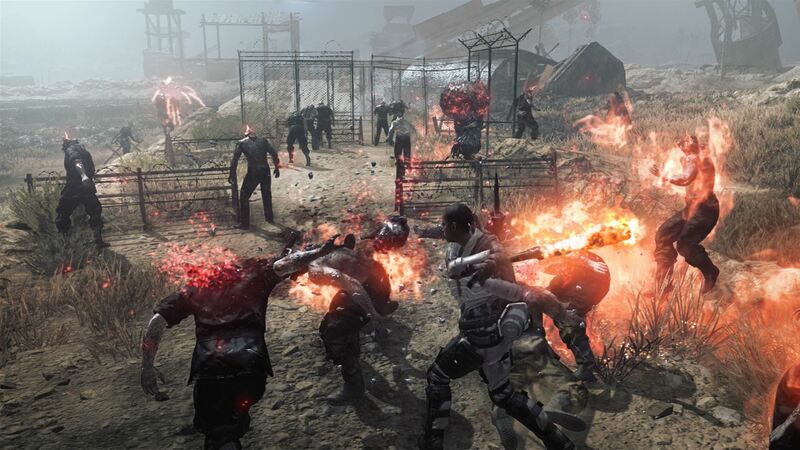 At its core, this is what Metal Gear Survive is. 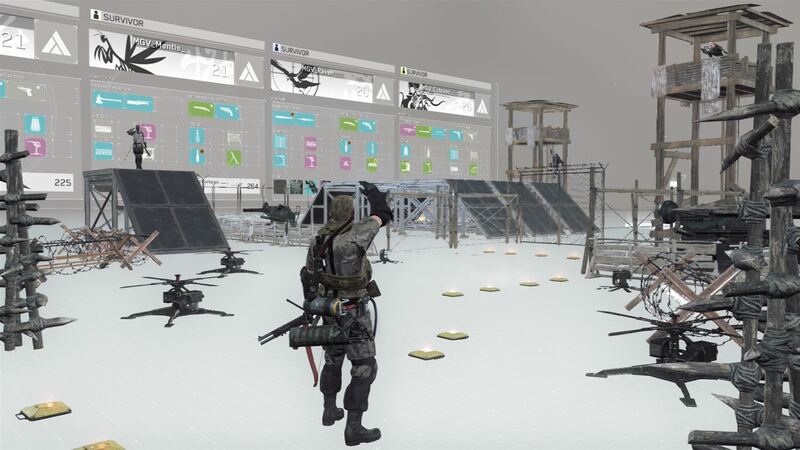 Survive is an odd duck in the Metal Gear universe, as it is unlike any other Metal Gear game, which is both a blessing and a curse. Accept the game for what it is – a grind to level up and improve your character and base – and there is fun to be had here. Come expecting a Metal Gear game though and you may be disappointed. For me, being a Metal Gear fan, I was sorry it didn’t feel more like the rest of the games, but with my sensible head on, there’s a lot of story and action to be had. At the end of the day, I enjoyed my time with Survive, and if you give it a chance, you may too.